Francis Quirk Master Painter Blog: Is this a Photo of a Francis Quirk Portrait of Robert Strider of Colby College? No. Is this a Photo of a Francis Quirk Portrait of Robert Strider of Colby College? No. Quirk's bio lists him as being commissioned by the Colby College Alumni to paint the College President Robert Strider. The College is located in Waterville, Maine so it is likely that he came to the attention of the school through his Summer presence there. But where is the painting. We checked the collection of the quite respectable Colby College Art Museum and their was no mention of him in the collection. An aside about the The Colby College Museum Collection, which appears to be well worth a trip to Maine to see. The collection includes major artists such as John Singleton Copley, Gilbert Stuart, Charles Willson Peale, Winslow Homer, William Merritt Chase, Mary Cassatt, Robert Henri, Paul Manship, and Georgia O’Keeffe. The Museum also showcases the work of significant 20th- and 21st-century American artists, including John Marin, George Bellows, Fairfield Porter, Marsden Hartley, Terry Winters, many works by Alex Katz. Adolph Gottlieb, Rudy Burckhardt, Chuck Close, Jennifer Bartlett, Lois Dodd, and Elizabeth Murray. Back to finding Quirks work... So we reached out to the President's Office figuring that the former President's portrait is an administration building conference room or hallway. We are waiting to hear back. In the mean time we did find a black and white picture of a portrait on the Wheeling Ohio Hall of Fame website where Strider is honored. There we came across this unattributed black and white image of an oil portrait. Is it the full image or a cropped close up? There does not appear to be a signature, was it cropped out? Only time and investigation will tell. 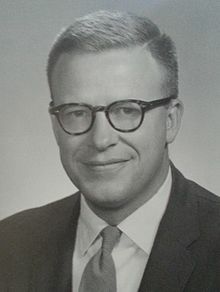 For reference here is picture of younger President Strider from Wikipedia. 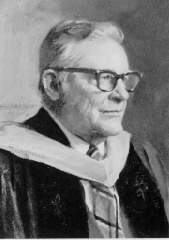 He was quite an accomplished fellow in addition to guiding the College through a period of extensive growth over a period of 20 years, he received 11 honorary degrees, served in numerous service posts and remained active until his death in 2010. Perhaps the portrait is in the Theater in Runnals Union that is named after him. As part of our ongoing research, we have since found the image of the actual portrait. You can see Quirk's work by visiting this post.